Kris Olds served on the Advisory Committee on the Center on Housing Rights and Evictions (C.O.H.R.E.) report Fair Play for Housing Rights. In January, he visited Vancouver, British Columbia, where the 2010 Winter Olympics will be hosted. Olds spoke with Am Johal at Lugz Café in Vancouver. Johal: What is the link between hallmark events and evictions? These events magnify existing development paths, they are implicated, but they are not the only factor. They are a key acceleratory mechanism to spurring on change, particularly since the 1970's. There is clear evidence that they have played a role in generating evictions from place to place. Is it the only force? No, but an event of this magnitude does play a role, it is implicated, absolutely. Do you think policies are in place today to prevent evictions in future host cities? I understand that there have been changes since 1985-86 in Vancouver. I imagine it might help somewhat. One of the positive and negative dimensions of these events is that it adds euphoria and excitement and governments can act in new ways in this environment. With respect to housing impacts, provincial governments (or state governments) can't assume landlords will not try to profit or that the inner city will not be hit by speculation. Take the case of Expo '86. People were caught up in the sweep of the euphoria. All of the landlords lost their shirts. They were completely naïve. They were completely irrational. An event brings with it a heightened euphoria. It's not a normal time. It's an important time to bring in extraordinary measures to mitigate these negative impacts. We need to adopt the precautionary principle. The positive impacts of these events are among specific areas, but the negative impacts tend to be in specific areas where people are not in a position to defend themselves. The staging of these events have an acceleratory factor, they are implicated, they play a key acceleratory mechanism to spurring on change. 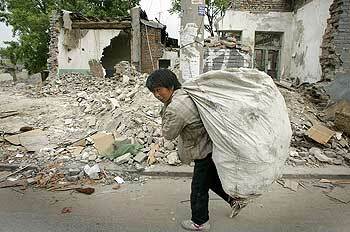 Particularly if you look at Seoul or Beijing—they have played a role in generating evictions. It is a regular pattern which unfolds differently in various places. I'm wondering if you could talk about the background to the C.O.H.R.E. report on hallmark events and evictions. It's organized by C.O.H.R.E. based in Geneva. Basically we were interested in what's happened related to evictions in association with mega-events like expos and Olympics. The founder of C.O.H.R.E. (Scott Leckie) met with me in the late eighties. COHRE has done studies on evictions in inner cities, and pipeline development and mega-events in general. Everybody was too busy and there wasn't funding available, though by 2001 or so things started to move forward. C.O.H.R.E. got more organized and they also brought in international human rights experts like professor Andrew Clapham. What happened was that they coordinated the research process and knitted it together. As a planning student at the University of British Columbia, you studied the evictions of Expo '86. Can you speak to that? First some context. The first time evictions came up as an issue for these types of events was in 1974 in Spokane, Washington, and in 1982 in Knoxville, Tennessee, in relation to the world's fair. They held these events to revitalize their "skid rows." People were trying to bring these events into the city center. In the North American context, they were trying to push things through and push through regulatory changes. They were concentrated on tenants in the lower income areas of the town. In Montreal during the 1976 Olympics, there were billboards hiding the public from seeing the poor. Expo '86 was many years in the making. In the1982-83 period, when Expo planning was underway, there were many changes occurring, including the loss of Single Resident Occupancy (S.R.O.) hotels. The fair was held for six months in 1986. There were concerns that the Social Credit provincial government had an interest in cleaning up the neighborhood. I ended up working with the planning department at the city, D.E.R.A. [Downtown Eastside Residents Association, in Vancouver] and university people to try to chronicle the debate. Given what happened, 550-850 people were evicted, and there were losses of hundreds of S.R.O.'s. A number of people committed suicide in relation to those evictions. What is happening in Beijing? Like Seoul, they have tried to symbolize a transformation into the "modern" era and fast-track urban change. There are symbolic elements. It enables them to build facilities. They attempted to put themselves on the map. They are using these games to showcase China as a modern superpower. Yet in the process hundreds of thousands of evictions have taken place. The interesting thing is that while there are massive relocations, at least in the Chinese case there is alternative housing, but you wouldn't know as an evicted tenant when it's going to be available, where it is located, or what unit you will be placed in. You may be split from your neighbors as well. They are razing entire neighborhoods for bridges, sports facilities, and urban development. In China, it's an even more authoritarian context. It is dangerous to be a critic. The research team had to be anonymous. They were monitored, and some critics of the displacement process have been jailed. Some bloggers were jailed for talking about the housing context of these games. There's a range of reasons, there's a common pattern. These are big events, they require international power. Cultural elites have that power to organize and implement these policies and proposals. If it's only elites that have the capacity, they will clearly not know, not care or be sensitive to impacts. The cleavages between these elites and those being affected is wide, so there is a social dimension to what happens. Secondly, they are used as vehicles to speed up urban development processes. They're basically designed to generate the types of impacts on the urban poor. In practice, they are not necessarily trying to cleanse the inner city but trying to speed up urban development and change. There's some benign neglect and some social engineering taking place. It's clear that there are certain designs which have both a direct and indirect impact. In Atlanta for the 1996 Olympics, it was social engineering to remove African American residents from the city center. There was more money, more wealth, more restaurants. Bistros opened up where existing residents couldn't afford to eat. One of the arguments that comes up is that these events begin with a level of public investment to initiate the process and for the required infrastructure. The disproportionate beneficiaries of these events end up being tourism and real estate sectors. Would it be appropriate to temporarily tax these sectors to help fund social impacts? These events could not take place without significant public investment. Architects of these events try to extract monies, in association with these games and other types of these hallmark events. With respect to the Vancouver Olympic Games, clearly the road improvements will benefit people who live in Whistler. There's going to be many positive benefits. So, it's a way to use public largesse to benefit certain groups. This is some of the reasons they try to do it. Though they are negatively impacted, they attempt to use these facilities to showcase their legacy. I think with the Paris Olympic bid, 40 percent of the [proceeds from the] Athletes' Village would go to social housing. It can be used to benefit people if the right creativity and thinking is put to it—but that rarely occurs. I'd say they haven't really thought things through. Most people don't have experience in running these types of events. Historically, they haven't been very creative in spreading the benefits. The increase in value of Whistler condos could be taxed at a differential rate to help pay for some of the social implications of hosting these events. I know you haven't studied Vancouver 2010 specifically, what are some observations after being here the last few days? I'd try to adopt the precautionary principle and go the extra meter. People living in residential areas, who are tenants, could see evictions and demolitions. There needs to be policies in place so that this does not occur in the city. Even if it's a temporary thing, two months or even two days after the games where things go back to normal, precautionary/preventative policies and laws need to be brought into existence. Second, one of the big differences between the Expo '86 era and now is that the sheer cost of living in Vancouver has gone up. In a broader sense, it will certainly make it a more expensive place to live after 2010. Governments should try to keep the cost of housing low for its citizens. It's time to think creatively, buying S.R.O. 's, to create affordable housing supply in a place of over-inflated property values. The International Olympic Committee doesn't care about the cost of housing in Vancouver or whether it will enable or make it more difficult for young families to live here. Their objectives are to make sure that these sport events occur smoothly, that television rights are properly handled, that they don't get involved in the social policy issues. In an overall sense I'd say the key thing is the city and the province have to take on the leadership role. These are large-scale events that will have lasting effects on the city. It's important that institutions play a role in helping to contribute to the understanding of what is going on. Even studying how the media handles these events is important. Who is studying these housing impacts? I would say a much bigger role should be played by universities to contribute making sense of these development processes. Universities have a bigger role to play to facilitate shedding light on the development processes of these games and their impacts.